Wackydoodle sez: Hold yer nose and y'all won't notice! After three days of internal debate the Donald decided to launch some cruise missiles directly against the murderous Assad regime by striking a Syrian airbase [photo below] where the gas attacks against Khan Sheikhoun are thought to have initiated. Direct action against Assad was debated with Obama government for six years and the final answer was always NOT. 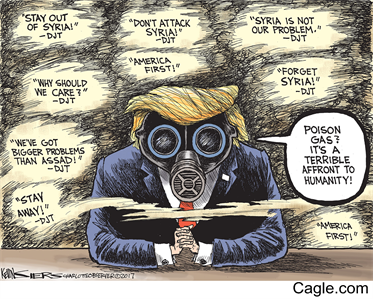 However, Obama's government was successful in negotiating a deal with the Russians to destroy the declared Syrian chemical stockpile. Apparently a few bombs went undeclared. So the Current Occupant has distinguished himself from his predecessor in Middle East policy regardless of his previous agitprop against targeting Assad's government. Of course the CMM is fawning all over his show of resolve. 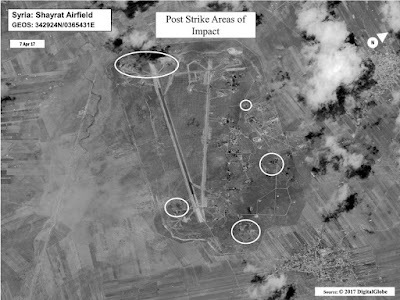 However, our NATO ally in the region, Turkey, called the strike "cosmetic" unless Assad is removed from power.